Home › Toys › Kidrobot Teenage Mutant Ninja Turtles Series 2 Tmnt Shell Shock Complete Set ..
Kidrobot Teenage Mutant Ninja Turtles Series 2 Tmnt Shell Shock Complete Set ..
Includes 1 of each of the 14 different figures to make a complete set. Theyall come with boxes, and some of them come with accessories. These are fromthe Kidrobot TMNT Shell Shock Series, 2016. They are all 3 inch vinyl figures,with different rarities. All of the boxes and foils were opened so that thefigures could be identified. 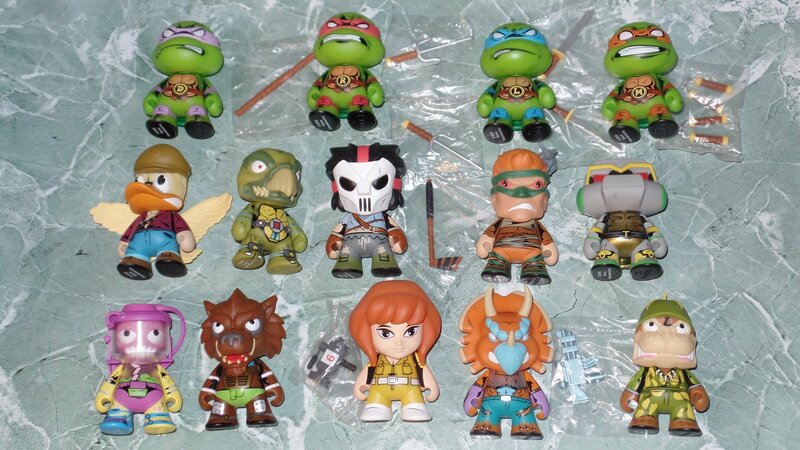 You get 1 of each of the following figures: AceDuck, April O'Neil, Casey Jones, Donatello, Leonardo, Metal Head,Michelangelo, Mutagen Man, Rahzar, Raphael, Rat King, Sargeant Bananas, Tokka,and Triceraton.